I just finished porting a 2D Linux game KLines to Windows in 3D using OpenGL engine which is my favourite. This game was coded using Delphi and no libraries (no glaux nor glut). Some animations were added to the original game to improve your visual pleasure :) Some AI algorithms were also used like the A-Star one. It is used to find if there is a valid path between the source and the destination cell. If there is one this algorithm finds it and there is one thing more : the found path is the shortest path available. The game works fine on Windows 98 / Me / 2000 / XP but requires a 3D accelerated card ( I'm absolutely sure almost all of FlipCode visitors have one :p ). The purpose of the game is to align five or more balls of the same color. The balls can be aligned horizontally, vertically or diagonally. Each turn allows the player to move a ball to another cell. If a move does not align five or more balls, three random balls are added to random cells. 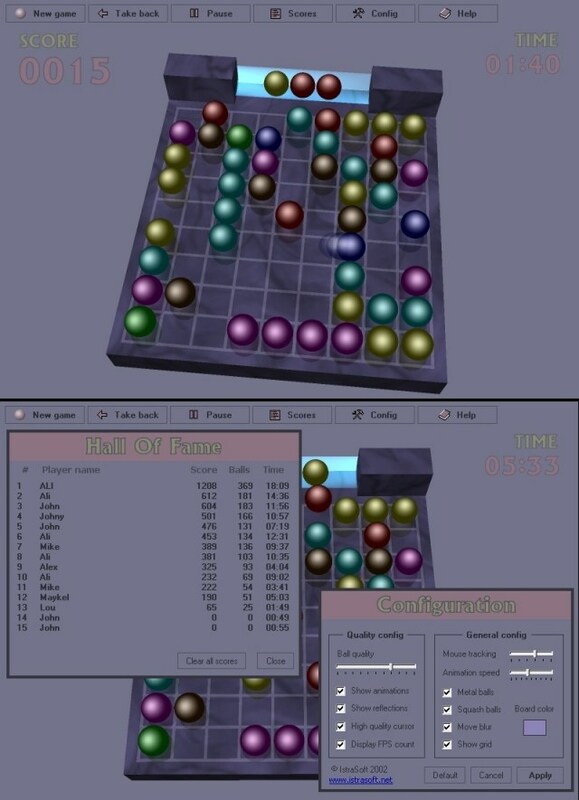 If a move aligns five or more balls, these balls dissapear from the board and no balls are added to the board.